Many people that work in the public service industry, health care or child minding industry are required to have current first aid and / or CPR certificates. Re-certification courses are designed for people that need to renew their award. Standard first aid re-certification are significantly shorter and cheaper than the original course. All standard first aid renewal programs through St Mark James include certification in either CPR level “A”, “C” or “HCP”. Automated external defibrillator training is also a mandatory component of the course. Each province has slightly different requirements for this course. 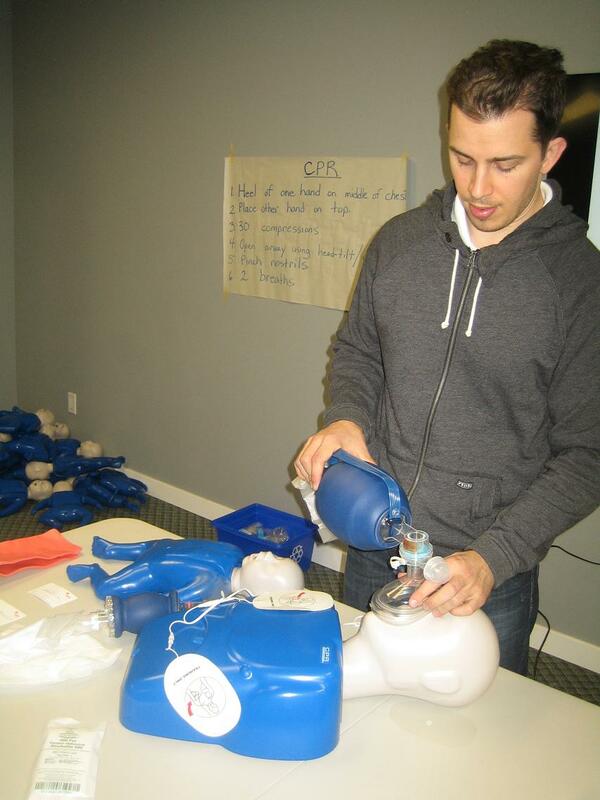 This page will outline the details and requirements for attending a standard first aid re-certification in Canada. A standard first aid renewal course, done through this workplace approved provider, is approximately 8 hours in length and almost half the cost of the full course. Candidates will cover the same curriculum as the full course, however, it will be taught in a condensed format. St Mark James instructor will focus on changes to standards and on areas that candidates need improvement. To be eligible for a standard first aid recertification candidates must have a previous certificate from a credible providers such as St Mark James Training or Heart and Stroke Foundation. Participants in Ontario must have previous certification through St Mark James. Candidates must have completed a standard first aid course or re-cert within the past 3 years. Furthermore, candidates must have a certificate from the same nation as the re-cert. First aid and CPR certificates are not nationally accredited and can only be recertified in another country if approval has been received from the provider. Finally, candidates must possess a certificate that includes standard first aid training. Candidates that have a certificate in another course such as emergency first aid or childcare first aid are not eligible for standard first aid certification. Individuals in Ontario must meet additional prerequisites for re-certification classes. Participants must have taken the previous course through a St Mark James provider and can not take re-certification classes consecutively. For every re-cert course a participants must take a “full” / regular course. Once a candidate successfully completes the skills portion of the re-cert and the multiple choice test, he or she will receive a workplace approved certificate that is valid for up to 3 years. Candidates may be required to re-certify at an earlier date based on employer or school policy. To register for a standard first aid renewal course select one of the highlighted links throughout the page (Click here to view our course locations). The links will re-direct you to another page where you can find more information and registration for a standard first aid re-cert. Keep your first aid skills current by taking renewal courses!